Web Design and Development is our creative core. Mobile App Development for your business. We make your Brand unique and unforgettable. We help you generate leads and increase sales! 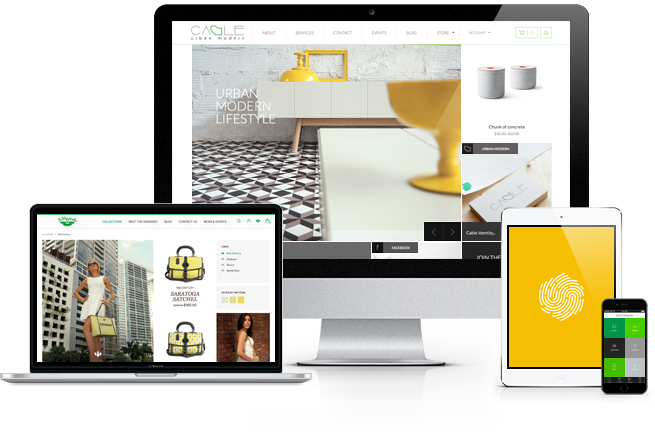 We worked together with Cable Design team to create an aesthetic and modern website to showcase the stylish products and interior design services the company offers to their customers in Miami. With the use of custom web design, personalized icons, and a modern layout, we were able to achieve Cable Design’s goals. We helped our client to create a membership system to provide access to their vast knowledge base of reports for emerging markets around the country. From custom web design to a recurring subscription platform, we converted Geoscape’s website into a hub for information and lead generation. The need for a user-friendly and scalable learning platform to provide members with videos, audios, and an online community were the bases for helping our client to development of a new website including a customized e-commerce section along with a complete migration from InfusionSoft containing thousands of customers, orders and subscriptions. We love solving problems, and we find in every new challenge an opportunity to help our clients to achieve their goals with our expert knowledge in user experience, web design, and programming. Whether it is an online store, a learning platform, or a membership system, our experts will provide you with the proper support to escalate your business and improve your sales. more than just having an online presence. It involves strategic planning, research and dedication. Our mission to help our clients goes beyond the online environment. It also expands to every place where its brand meets with their customers. With the use of inviting, fresh, and vivid colors pairing with their tropical flavors and their homemade style, we created a package design for Ceasar’s Ice Cream with the goal to showcase their products at grocery stores around the country. We love to create unique products for our clients. Whether it is a website, a presentation, or a brochure, our approach always looks for uniqueness. This approach drives us to create exclusive concepts to design logos that will develop a strong visual identity that will last a lifetime. So, Who We Are and What We Do? Cultura Interactive fuses website design marketing intelligence and original problem-solving to produce the most creative, memorable, and attractive websites for our clients. Our full service specialize in website design, logo design, WordPress development, e-commerce, responsive web design, mobile apps, SEO, social media marketing and pay per click advertising. We ask the right questions before beginning your website design, so we can be sure your site will meet your business and customers’ most important needs. Our creative ideas will exceed your expectations and delight your target audience. Our website design and content will communicate, not just decorate your business and brand — our goal is to create effective websites, not just good-looking ones.